← Relationship: You Cheated? You Fix It! Relationship: For Better? No Much Worse. There is a homeless couple whose marriage has been solid and strong, regardless of the problems they’ve encountered. (Let’s call them Grace and Tom). I was on The Female Solution radio show, for relationship day last week. The host Naimah Latif spoke of a married couple she met 20 years ago who were homeless. She recently saw them again, and found them to be homeless still, with their marriage just as strong when she spoke to them 20 years ago. 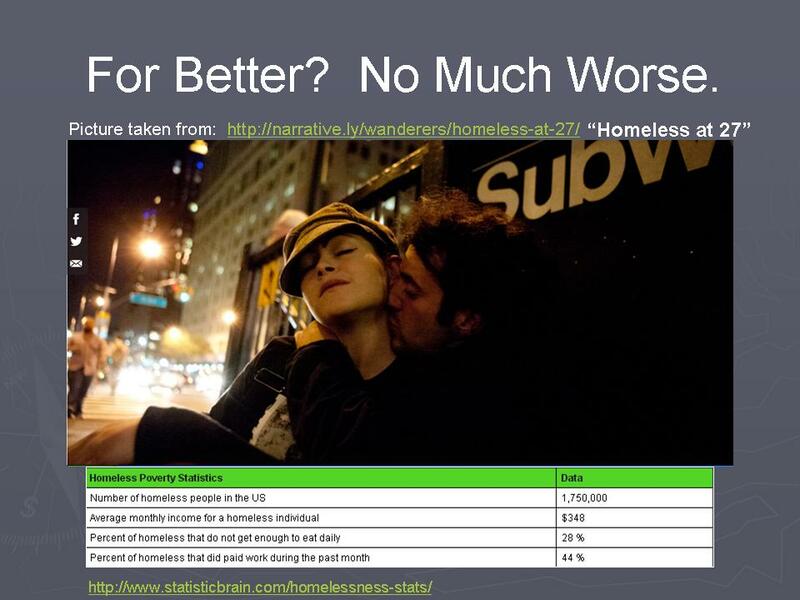 If homelessness has not destroyed their marriage, then practically nothing will. Grace has some living family, who tells her she can come and live with them, but she is not allowed to bring Tom. They feel he is the reason for the couple’s condition. Grace says, “Tom is a good man, and I am sticking with him. I will continue to stand by him”. Tom has no family. How can a couple face one of the most devastating situations in life, yet maintain a strong relationship? They are the family they don’t have. There is one thing they share each and every day. Survival. Where can they find food and shelter for the day? We have food and a place to live. Many of us are living better lives than our parents. Yet, we lack strong and solid relationships? Think about it. The more we have the needier we become. Some of us are so materialistic, we lose the value of life. The more we spend, the more we must spend just to maintain what we have. Our relationships would be much stronger if we brought more quality of life to them, which would in turn bring more quality of life to others. Regardless of homelessness, Grace and Tom has not lost the strength of their relationship, which is rooted and grounded in survival. It is not the material that makes their relationship. Quite the opposite. We take much for granted, and this permeates the way we operate in the relationship. We whine and fuss over trivial matters. According to the website, “all women stalk, http://allwomenstalk.com/12-things-most-couples-argue-about-and-ways-to-avoid-it/5/, we argue over toe nail clippings, household chores, snoring and other things. Grace and Tom are beyond the frivolous arguments in life, because their relationship is more basic and simple— removing the unnecessary drama we incur simply by having more. Time does not permit for the unnecessary emotional trauma that will cause separation in their relationship. There is no blame game for whose fault it is that they’re homeless. We, on the other hand play the blame game anytime anything happens. Being together is what keeps them together in a world of hunger and lack of shelter. In their world, there is no time for ultra sensitivity, and selfishness. We are quick to place blame, but limited in creating a solid resolve. Togetherness is the glue. It is the reason why Grace opted not to take shelter with her family. She refuse to leave her husband behind. Togetherness builds unity and loyalty. It encourages faithfulness, and dedication. There is no division, only a willingness to stay together, regardless of how difficult things are. If a couple who is homeless, have a good relationship, why can’t we? We have food, shelter, a 9-5, and good living conditions. Why can’t we make survival our daily goal together also? Just because we do not search daily for food to eat— besides going to the grocery store to search for the ingredients of a recipe: and just because finding a safe space outdoors to sleep for the night is not our daily plight, does not mean we do not have our own needs of survival. Like keeping our relationship safe from selfishness, lying, greed, poor communication, deception, betrayal, division, mistreatment and foolish destructive decisions. We also have other survival necessities like, preventing financial ruin and building financial wealth or comfort, maintaining an intellectual database, political and health awareness, creating solutions to world hunger, creating strategies to remove homelessness, emotional intelligence, and doing it all— together! Let’s refrain from damaging the relationship with things that divide us emotionally, physically, spiritually, financially and mentally. Just like Tom and Grace, we too can be relationally strong by embracing and living the concept of togetherness. There is affirmed power in the equation of 2. Really being down with the “we” factor and not creating needless or irrelevant issues that create division and separation. Embracing the togetherness concept is not about you alone, nor about me alone. It is about what we both need— together. This entry was posted in Actions in Relationship and tagged homeless relationships, materialistic relationship, overcoming problems in relationship, removing trivial matters in relatinship. Bookmark the permalink.